When you partner with DSS you’re getting more than just software and training. You’re assured of expertise, custom solutions and our guaranteed commitment to excellence. Notable clients include XMCO INC., Northrop Grumman Corporation (NGC), BAE Systems, Lockheed Martin Company (LMCO), U.S. Army TACOM, USAF AETC. Development of technical publications for the defense industry in a number of standardized formats following applicable MIL-STDs. Development of technical illustrations to support all types of technical documentation. Design and development of Standard Generalized Markup Language / Extendable Markup Language (SGML / XML) based IETM/IETP/ETM viewers into acceptable electronic format reflecting industry standard Document Type Descriptions (DTDs) and their associated markup tag sets. A custom-designed software technology which introduces intelligence to electrical, hydraulic, pneumatic and fluid flow schematics and drawings and the electro-mechanical interface thereof and which significantly enhances both maintenance and training disciplines. The DST is comprised of two separate but integrated applications referred to as p2Trace™ & p2Sim™. A revolutionary troubleshooting tool that is especially effective when working with large, complex schematics. Allows for easy navigation and viewing of schematics and facilitates instantaneous access to any schematic, component or wire. 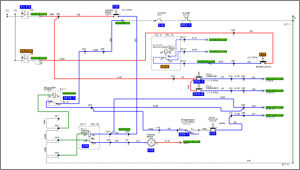 Interactively traces signals and flows through a system, showing accurate paths through cables, connectors and harnesses. A visual maintenance and training tool which electronically illustrates equipment operation and troubleshooting concepts. A fully interactive emulation of all circuitry associated with a specific system function that also displays color coded animation depicting electrical, hydraulic and pneumatic flow under various conditions. Understandable theory of operation and locator graphics enhance the learning and understanding process. Professional conversion of technical data (text / graphic) from any known source (e.g., paper, pdf, CAD, etc) into usable vector format to support all DSS software applications. DSS also offers on-site user training for all developed and delivered applications.